Halle's personal makeup artist, Laura Mohberg, was responsible for the now famous bronze bombshell's Bond Girl look from "Die Another Day". Using products from Revlon's "Jinx Color Collection", Mohberg used the Wet/Dry Shadow Quad in Jinx on Halle's eyes. She started out by applying the berry colored shade to both the top and bottom lash lines. "I kind of blended it out a bit to give it a wash of color but closer to the eye to give it more of a smokier effect," she explains. Next, she adds the light pink shade along Halle's brow bone as a highlighter and made sure to blend it in well. She used Lash Fantasy in Bond Berry, starting out first with a primer to thicken the lashes. For a golden accent Mohberg, used the Triple Agent Color Stick in Top Secret Bronze on the inside corners of the eye as a compliment to the gold undertones that show up in the berry color. On Halle's cheeks, Mohberg brushed on Swirl Blush in Jinx and in keeping with the golden tone, blended a bit of the Top Secret Bronze color stick to the cheekbone, first applying to the back of her and rubbing it in lightly by hand. Above: One of the images of Halle Berry used in the Revlon campaign. On her lips, Mohberg used the Super Lustrous Lipstick in Berry Avenger, which she describes as deep purple with gold flecks. To give the illusion of a pout Mohberg topped the look off with a bit of Top Secret Bronze only in the middle of Halle's lips. 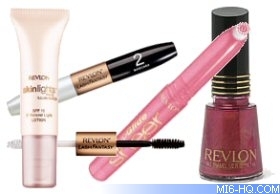 Revlon launched a series of "Bond Girl" make-up products to coincide with the release of "Die Another Day" - and included the looks for "Jinx" and "Miranda Frost". The Revlon 007 Color Collection was developed behind the scenes of "Die Another Day" and based on set sketches, fabric swatches and the style of the two leading Bond girls. Now you can create the "Jinx" look with a great competition to win Revlon items. A lucky (female) Bond fan will win the following goodies: Skinlights - Face Illuminator, Lash Fantasy Mascara Fantaisie Pourcils, Lip Glide Sheer Colour Gloss - Gloss Couleur Transparent - Sheerly Cocoa 05, Lash Fantasy Mascara Duo Fantaisie, Lip Glide Colour Gloss Couleur - Pink Light 15, Nail Enamel - Pink, Summer Skin Sunblush - 01 Peach Sheen, Lip Glide Sheer Colour Gloss - Lustre Couleur - Sheerly Bronze 020, Summer Skin Sunblush - 02 Rose Sheen. Halle Berry's character "Jinx" from "Die Another Day" worked for which organisation? The competition closes at midnight on 7th December 2003. MI6 will choose the winner at random from the correct answers received. The winner will be contacted via the email address supplied and their postal address will be requested. If a winner fails to respond within 7 days of prize notification, another winner will be chosen until one is found. Competition is open to international MI6 readers. The winners name may be announced on mi6-hq.com after the prize has been awarded. Please note: winners outside of the USA may have to handle customs charges on receipt of the prize - please check your country's customs policy. MI6 is an unofficial non profit website that is in no way associated or linked with MGM, United Artists or EON Productions. James Bond 007 are registered trademarks of DANJAQ, LLC, a Delaware corporation in the United States and/or other countries. Original content is copyright mi6-hq.com © 1998-2003.